This puzzle is like a 4×4×5 Rubik's cube. The two 4×4 faces and middle layers can be turned by quarter or half turns, but the four 4×5 faces and slices only allow half turns. The last factor is due to there not being any fixed reference point to distinguish the sides, or the top and bottom. This gives a total of 2·8!8·4! / (4!2·213·8) = 8,881,841,338,019,706,883,276,800,000,000 positions. Hold the puzzle with the square faces at the top and bottom. Clockwise quarter turns of the top or bottom layer will be denoted by U and D respectively, half turns by U2 and D2, and finally counter-clockwise turns by U' and D'. Turns of the upper and lower inner layers will be denoted in the same way, except that the lower case letters u and d are used. For the side faces the letters F, B, L, and R represent half turns of the front, back, left and right face respectively. Similarly, lower case letters f, b, l, and r represent half turns of the vertical inner layers adjacent to the F, B, L, and R face layers. Phase 1: Solve the outer layer centres. Phase 2: Pair up the outer layer edges. Using only outer layer moves that do not disturb the first mismatched pair (i.e. L, R, D, B), bring this second edge pair to the top back. There must be another mismatched pair somewhere. Without disturbing the other two mismatched pairs (i.e. using L, R, and D), make sure that there is an unmatched pair at the top right location. Match up the edges by doing the move sequence F rR U R U' rR. Phase 3: Pair up the inner layer centres. Find any pair of adjacent centres in the inner layers that do not have matching colours. Hold the puzzle so that this mismatched pair lies in the front face at the top. Find another mismatched centre piece that matches the left centre of your mismatched pair. Using only moves that do not disturb the first mismatched pair (i.e. L, R, d, B), bring this second edge pair to the top of the back face. Note that the centre matching the left one of the front pair must be the left one of the back pair (i.e. they both lie in the l layer). If that is not the case, do steps b-c again with a different mismatched centre of that colour. Without disturbing the two mismatched pairs (i.e. using L, R, and d), make sure that at the top of the right face there is an unmatched pair, or a pair of the same colour as the centre at the right of the front mismatched pair. Match up the centres by doing the move sequence F rR u R u' rR. If we ignore the middle layer, the puzzle has now essentially turned into a 3×3×4 cuboid. All but the middle layer can be solved without breaking up the matched pairs, i.e. without using any vertical inner slice moves. 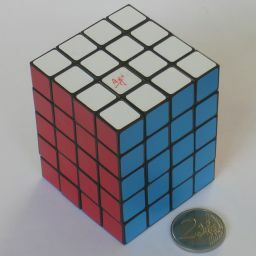 The next 4 phases are exactly the same as the 3×3×4 solution. Phase 5: Solve the top and bottom layer edge pairs. First put the edge pairs in their correct layer. Turn the top and bottom layers so that both have an incorrect edge pair at the front, and do U2 RFR U2 RFR. Repeat this until all the edges are in their correct layers. Repeat b-d until the top layer edge pairs are be solved. Turn over the puzzle so that the bottom layer becomes the top layer, and do steps b-e to solve those edge pairs at well. Phase 6: Solve the edges of the two inner layers (not the middle layer). Phase 7: Solve the centres of the two inner layer (not the middle layer). Turn the middle layer until as many of its edges are solved as possible. If none can be solved, then do R M2 R M2 and try again. 1. To swap FR and BR, do Rr (Uu)2 Rr (Uu)2 Rr (Uu)2. 2. To swap FR and BL, do B Rr (Uu)2 Rr (Uu)2 Rr (Uu)2 B. Hold the puzzle so that some of the incorrect middle layer centres are in the front and back faces. If both of the front middle layer centres are incorrect, do r2 M2 r2 M2. 1. If the front incorrect centre is on the right, then do an F move to bring it to the left, the Fl location. 2. If the back incorrect centre is on the left, then do a B move to bring it to the right, the Br location diagonally opposite the front incorrect centre. 3. Do (Uu)2 Rr (Uu)2 F (Uu)2 Rr (Uu)2 to swap them. 4. If necessary, do F and/or B to return those layers to their correct locations. If necessary repeat a-c for the other pair of faces.